Today is the day for our August Edition of #PassTheScopeEDU and we're excited to make it happen! It's been a crazy wild for me in the last couple of week with me accepting and starting a new job, but I'm excited to be back with my #PassTheScopeEDU crew and hope you'll join us today. Our theme for August is "What did you learn this Summer and how will you use it this year." This is such an excellent topic as school is about to get started because it can help us remember all the amazing things we learned and hopefully help you to also remember some of the amazing things you learned as well. But what is it and how do I take part? #PassTheScopeEDU is an event where educators use Periscope to create a live broadcast (called a Scope) and share their thoughts. 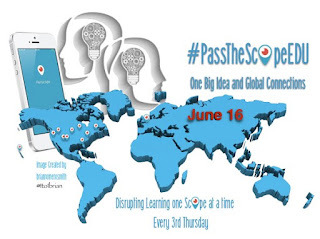 Each person participating will be using their own Periscope account and those of us following along will use Periscope to follow and watch their scope wherever we want, making #PassTheScopeEDU a truly personalized PD opportunity. For our #PassTheScopeEDU event, we're gonna keep each scope live stream to about 5-10 minutes. When the first person finishes their scope they will tell you who is next up and what their Periscope user information is so you can go watch the next part. This continues until the last person finishes and the event ends. We didn't invent the idea of #PassTheScope, but we are very excited to do another one and share some great educational ideas. If you are more of an auditory learner, check out this great episode of the Hack Learning Podcast by Mark Barnes, who is also participating in this month's edition of #PassTheScopeEDU. It's a great explanation that is short enough you can listen just about anywhere. Come join us for #PassTheScopeEDU and don't forget to follow each of these amazing educators on Twitter and Periscope! Also, if you follow the #PassTheScopeEDU on Twitter at @PassTheScopeEDU you'll see reminder tweets so you don't have to worry about when the next scoper is starting. And remember, if you watch, feel free to give lots of hearts because we love you!